With meditation one can learn to be in any scenario and access it from an optimistic stance. When we work together, we focus on seeing the truth of our situations. In conducting my meditation and mindfulness work, I meet many seemingly happy-go-lucky types who focus their attention on positive thinking. Chances are, many of you also aspire to this lifestyle. There are countless websites, Facebook pages and self-help diatribes dedicated to the upbeat idea. However, this recent HuffPost blog on PT books states, "Positive thinking is at once the most widely embraced and the most frequently reviled philosophy in America." So, let me get straight to the point and continue with more of the reviling (actually, how about we clarify instead of revile). In my professional experience, I find that pursuing positivity only helps foster that which you are trying to avoid. The boo. The hiss. 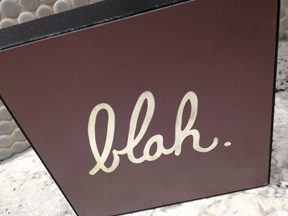 The blah. To help hit this home, check out this well-crafted article from Fast Company -- "5 Big Happiness Myths Debunked -- The Power of Negative Thinking" which discusses the over pursuit of goals and challenges of self-esteem. And this frowningly funny review from The Guardian of the book Smile or Die. Interestingly, these articles also give a nod to the power of negativity which, hey, ain't the answer either. Now, many of my participants find me because they are dealing with hard issues -- abuse, cancer, PTSD, depression, anxiety and addiction -- as they desire to find peace. Positivity isn't where we go for glory, and we certainly don't sit around stuck in the negative either. We use the stabilizing power of meditation. With meditation one can learn to be in any scenario and access it from an optimistic stance (note -- learn more about optimism near the article's end). When we work together, we focus on seeing the truth of our situations. This "truth" is based on the individual as no one person holds the same perceptions, attitudes, experiences and ideals. We do this by sitting in quiet and watching what comes. We watch with calm so we can allow ourselves to see our feelings with distance and detachment. This showcases the details that are clouded by past situations/confrontations, shielded by inaccurate views of who we truly are and we can actually start to hear our un-beneficial inner talk (which we all have). The end result -- we see situations more clearly, ourselves more empathetically and garner a deeper understanding of other people's actions. In this authentic work we obviously do not shy away from emotional reality. We become vulnerable, we examine, cross examine, rethink, unthink, restructure, then look again to make sure there isn't an aspect that hasn't been unturned or unfelt. And, we do it in a way that doesn't dredge up the past, but asks the past to present itself naturally without bias. No, this isn't easy or pain free. But, people will attest, that once you experience the freedom of looking at the hard stuff, you'll never want to go back to looking away. Here we find balance and sacred wholeness because we allow ourselves to be with the whole gamut -- anger, envy, fear as well as love, happiness and joy. The positives and negatives must be allowed to share the same house. Anyway, one of my kids was outside with our dog. After asking for help several times and getting many "nos," like a hot spark my anger swelled as I yelled out a strong obscenity. Yes, at my blessed kid (with special needs, no less). And yes, it was like someone put a megaphone inside my mouth and cranked the volume so my whole neighborhood could hear. I was angry and embarrassed. When I quickly cooled off, I gut laughed. That moment was so real. It was not perfect, by any means, but in a sense it was. I also apologized and gave my girl a big hug. I told my students about the incident the next day and they said they would have "cheered me on." Again, not that I was yelling at a sweet, toe-headed girl and a fluffy puppy but that I was being genuine, however rotten, ugly or gentle that might be. And, because I also know both sides and how to bring it back around. Please understand, it isn't about putting your sh*t out there or hurting someone just because you can. I am a gentle soul who previously held all "bad" emotions inside, so for me, this is tremendous progress. Plus, my students just like to hear that I am normal. Now, here are two positivity concepts to ponder. First, to focus on the positive, you must also acknowledge the negative. In other words, to see one; you must also see the other. And, what do you do with this negativity? You must rise above, step up, push it away or push it down. Basically this scenario creates an inner, energetic tug of war between mind, body and soul. I've watched this with so many students. When you push something down, it will creep back up into your face whether that is literally a zit, cancer, stomach problems, etc. Your body is a master communicator when something is out of whack. Also, what about judgment? Positive thinking cannot exist without it. If you judge something, you are not only critiquing the person or situation but also holding a yardstick to yourself. Smart, stupid, unjust, corrupt, mean, nice. Your mind has to make a limiting black and white decision. This is where I bring forth again the word "optimism." Optimism can see benefit in all things with equilibrium and reality. Can you feel the difference? So, yes. A happy, skip-to-my-Lou life isn't about pointing out who or what is right or good, or finding bliss or an escape route. It is about balance -- being in the moment and somehow, some way, being "okay" with whatever is. It is the art of detachment but to me, it is even more delicate and bigger than that. It's about breathing in the bigger picture, the intricacies of how we are all connected and how we are magically placed in our bodies to learn and grow. All of life is an opportunity. Now, that's a healthy dishin' of some sweet optimism.